This morning seemed nice enough so I drove up to Force Lake to check things out. It was pretty calm, the usual Mallards and mergansers milling about. A Belted Kingfisher up on the phone lines. An egret here, a heron there. I took the dogs out and planned to walk them along the funny stretch of road that is closed between the Portland International Raceway entrance (where there is a big off-leash dog area) and Heron Lakes Golf Course (where Force Lake is located). We got maybe a quarter of a mile, probably less, but it felt like more when I spotted a Bald Eagle up in a tree. Of course I had to take pictures even though he was behind lots of branches and I knew they would be bad. Yep. He wasn't even looking in my direction. So while I'm stopped Jake is pulling on the leash. He sits down which usually indicates he doesn't know what to do with himself. He gets up with his nose in the air. Then he starts pulling again. I figure a deer is in the wooded area. I let him pull me a few steps when I see a coyote face on the other side of the 4 foot wire fence that surrounds the Vanport Wetlands Area. I'm about to raise my camera when I see another coyote face next to that one. Now let me just say that coyotes don't scare me usually. But I realized today that this is because they always turn around and walk away. Even when there's five of them and only one of me. That did not happen today. This second coyote is EXCITED. He is pacing in front of the fence, whining, just like a shelter dog hoping I'm going to adopt him. Christ. I nearly poop my pants. I yank the dogs back and take off with them towards the car and thankfully the coyotes don't realize how easy it would be for them to jump the fence or even go around it. Back at the car I am shaken, but in that adrenaline-pumping excited kind of way. I mean, what would those coyotes have done? Would they have attacked the dogs? Did they want to play? I didn't get an aggressive vibe from them, more curiosity and excitement than anything. It was a really interesting encounter. Just a week or two ago I came across a coyote at Kelley Point Park with the dogs on leashes also.. That coyote took off for the woods. This whole urban coyote thing is so fascinating to me- that they are all around us but rarely seen... Someone posted this great NPR article on their blog recently about coyotes in Chicago... Check it out if you get a chance. Anyway. That's not birds. Here are some birds. Well that was enough excitement for me today! Excellent photos, especially the Downy Woodpecker and Golden-crowned Kinglet! I believe your Ring-necked Ducks are actually Lesser Scaups. The two species can easily be confused. The Ring-necked male should show a jet black back contrasting greatly with its gray sides, which have a bright white "spur" toward the bird's breast. Ring-necked males will also show a strong light-colored ring on their blue bill, and their heads are much more egg-shaped or peaked in comparison to scaup. 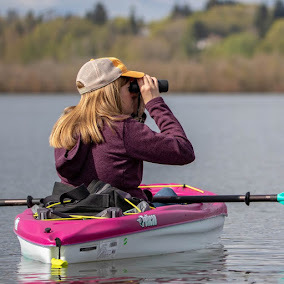 I am learning as well, and it seems that in this neck of the woods, we want to triple check all of our Lesser Scaups for Greater Scaups and all of our Ring-necked Ducks for Tufted Ducks. Good birding, and I look forward to your next post! Loved the Spotted Towhee... They are so colorful! We don't have here in Northern VA.
Oops, thanks Rhett! And John, that sounds like a really interesting study... Lyme disease 3 times?! Yikes! Seems like there are some celebrity coyotes in Portland these days: http://blogs.opb.org/fieldjournal/2010/12/13/video-shows-wild-coyote-in-portland-in-broad-daylight/. I've heard they are in my Parkrose neighborhood, too. I just love those Ruddy Ducks! I love your blog. I live in east Gresham and have coyotes in the neighborhood. I decided to learn more about them and found this blog: http://coyoteyipps.com/. Check it out and you will learn a lot about their behavior especially when interacting with dogs. Carley- thanks for the link! My friend used to see a coyote on her morning bike rides to work through Irvington a couple years ago... I've heard they are here in Overlook too- not to mention getting on the MAX. Thanks for the coyote yipps link too! Looks like some helpful info for my next encounter! As usual, great photos. I posted yesterday a photo of a coyote in the middle of our street in West Linn, and a few months back I got pictures of two of them in my backyard chasing a raccoon up a tree. Last week, there was one here where I work in Oregon City allegedly CHASING employees. Is this a new epidemic, or are we reading about it more because of the internet? Not sure, but if they continue to lose a fear of humans, the consequences won't be good. The coyote here at work was trapped this week and, er, disposed of.